In between concerts at the Ravinia and Verbier Festivals, violinist and conductor Maxim Vengerov can be heard in Monaco and Brussels this weekend, appearing on two gala programs. On July 27, Vengerov appears at the Naked Heart Foundation’s Love Ball in Monte Carlo, supporting the charity’s mission to ensure a loving family and safe place to play for all children, in its annual fundraiser. Vengerov appears alongside compatriot ballerina Diana Vishneva, a principal of both the Mariinsky Ballet and American Ballet Theatre. Together, they perform Mikhail Fokine’s ballet The Dying Swan, set to Saint-Saëns’s “Le Cygne” from Carnival of the Animals, at the Opéra de Monte-Carlo. The evening of July 28 finds Vengerov in Château du Lac, Brussels, for the closing gala concert of Musica Mundi, the summer music-training course for young musicians. As an artist-in-residence for the program, Vengerov appears alongside fellow violinist Ivry Gitlis and pianist Itamar Golan, as well as the Young Talents Ensembles and Orchestra of Musica Mundi. Vengerov’s next concerts take him to Brussels and the Verbier Festival. For more information, click here. With two concerts at the Ravinia Festival on July 15 and 17, violinist and conductor Maxim Vengerov will make a much-anticipated return to the United States in both a recital and concert setting. 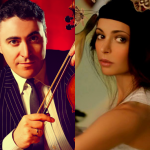 On July 15, Vengerov reprises his recital program with pianist Itamar Golon that the two performed on July 12 in Bordeaux, which features sonatas by Beethoven, Schubert, and Franck, as well as Saint-Saëns’s Havanaise and Introduction & Rondo Capriccioso. 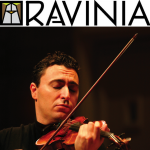 On July 17, Vengerov joins James Conlon and the Chicago Symphony Orchestra for Britten’s Violin Concerto, marking the composer’s centennial with the first performances of his 1939 work at Ravinia. The program continues the Britten celebration with Four Sea Interludes from his opera Peter Grimes, and also celebrates Wagner’s bicentennial with overtures and preludes from Rienzi, Der fliegende Holländer, and Lohengrin. 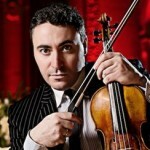 Following recent successes in Tokyo with his first annual Vengerov Festival (where he performed four different programs as violinist, conductor, and teacher) as well as closing the Istanbul Music Festival with Dvorak’s Violin Concerto, Maxim Vengerov continues his busy summer with two concerts in Europe this week. This starts on July 10 when he joins the Filarmonica de Cámara de Valencia in Riga, Latvia. Comprised of members of the Valencia Opera House’s orchestra, hand-picked by Lorin Maazel and Zubin Mehta, the chamber orchestra performs at Riga’s Dzintari Concert Hall. Vengerov will be heard throughout the program with Mendelssohn’s Violin Concerto in D minor, Bach’s Double Concerto in D minor, and three works by Tchaikovsky: Sérenade mélancolique, Souvenir d’un lieu cher, and Valse-scherzo in C major. Ricardo Casero conducts the evening’s proceedings. Two days later, Vengerov turns to Bordeaux for Musique en Graves, of which he is honorary president. 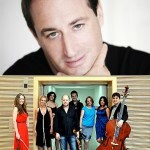 The festival’s opening night on July 12 finds Vengerov with frequent recital partner Itamar Golan in performance at the Domaine de Chevalier vineyard in Léognan. The pair offers sonatas by Beethoven, Schubert, and Franck, as well as Saint-Saëns’s Havanaise and Introduction & Rondo Capriccioso. These two concerts precede Maxim Vengerov’s return to the American concert stage, where he reprises his recital program with Golan (July 15) and plays Britten with the Chicago Symphony Orchestra (July 17), both at the Ravinia Festival. On June 29 Maxim Vengerov will bring this year’s Istanbul Music Festival to a close, performing as guest soloist in Dvorak’s Violin Concerto in A minor with the Borusan Istanbul Philharmonic Orchestra. Vengerov’s Istanbul performance is his first since last performing there twelve years ago. Next month, Maxim Vengerov makes his highly anticipated return to the American concert stage, performing at the Ravinia Festival both in recital and in concert with the Chicago Symphony Orchestra.